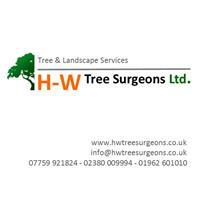 H-W Tree Surgeons Ltd - Landscaper , Tree Surgeon based in Eastleigh, Hampshire. Heaton-Wright Tree Surgeons are a family run business consisting of highly professional and qualified Tree Surgeons and Groundsmen. Although based just outside of Winchester, Hampshire, we also cover neighbouring counties including Dorset, Wiltshire, Berkshire, West Sussex, Surrey and London. We have been operating for over 20 years in both the commercial and domestic sectors. Our operatives work to a high professional standard, with a polite and positive attitude towards both our work and our clients. We have 5 million pounds public liability insurance and are a CHAS accredited company. We possess all relevant HSE policies and complete risk assessments and method statements where required. Shaping. pollarding & crown lifts. Heaton-Wright Tree Surgeons hold a waste licence and are certified in waste management. All sites are left clean and tidy upon completion. Please contact us for more information or a free quotation.